This was Tucumcari in 1937 or 1938. 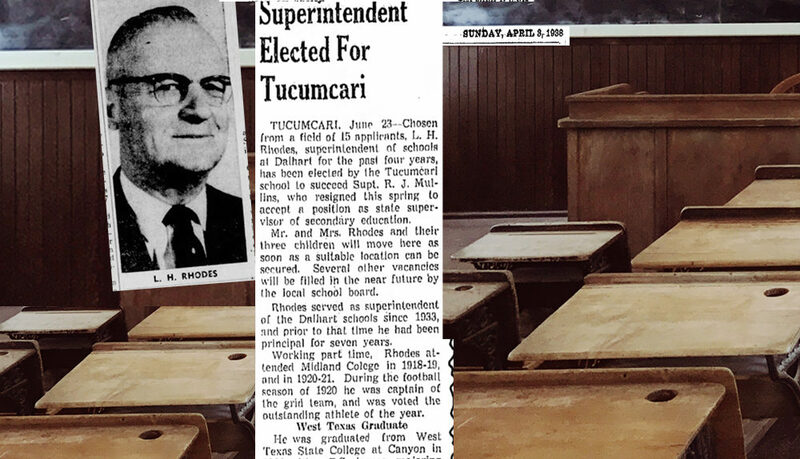 My grandfather was still a city attorney at the time and Mr. Rhodes had recently, in 1937, became the new superintendent of the Tucumcari area schools (click to read a little more about Rhodes when he was elected in the 1937 newspaper article, “Superintendent Elected For Tucumcari“). I had never heard my grandfather talk much about racial issues growing up. I am finding out more and more about them weaved into his stories as I dig through them, while also reading newspaper articles and books or other things I stumble upon when doing my research. One of the books I found while trying to find more background on the boy (who is never named) in my grandfather’s story is, African American History in New Mexico: Portraits from Five Hundred Years. 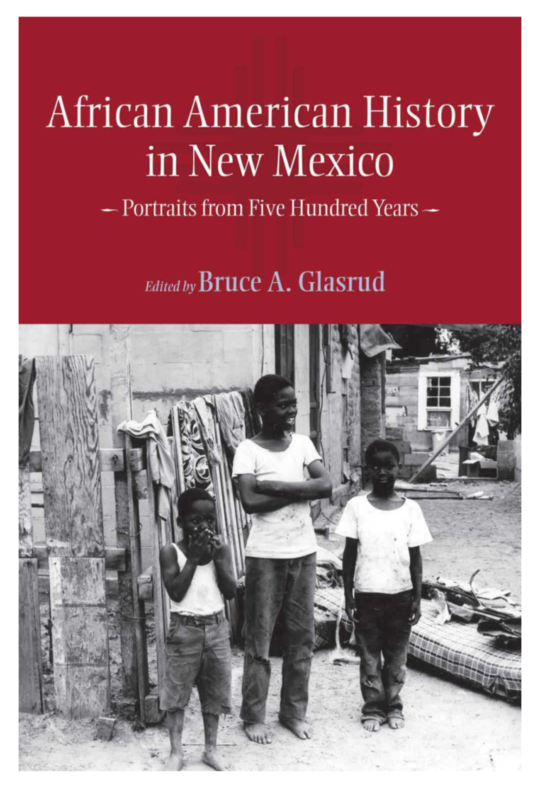 The book, from University of New Mexico Press, provides an overview of black history and experiences in New Mexico, both chronologically and thematically and includes articles on black experiences in the state. Specifically, chapter 15, “Haroldie Kent Spriggs and Sammie J. Kent: Integrating a White High School in the 1950s” documents the personal experiences they had while growing up in Tucumcari in the 1950s. I love the very personal stories about their experiences that are included in this chapter and specific accounts of local people in the community. It’s a great read for anyone interested in New Mexico history and finding out more about an individual’s own experiences in that time period. Growing up in the 1970s and pretty naive I guess, I didn’t realize that segregated schools had existed in Tucumcari. There were a few black families in Tucumcari and all kids were in the same schools in the 1970s. It was just something I didn’t think about being in Tucumcari’s past. I guess I just thought it had happened in other places, not in Tucumcari. So when I read through my grandfather’s story about this black boy in town who wanted to go to school in 1937/1938 and it apparently being enough of an potential issue for Superintendent at the time that the city attorney became involved in, I began to do a little more research. I realized that in 1937-1938, not a whole lot in newspapers of that time had stories like this in the news, or at least I couldn’t find them. I have yet to discover who this boy is that grandpa talks about in his story. I am almost certain he is not a Kent, as they arrived in Tucumcari a little later on according their stories in the “African American History in New Mexico” book. When I came to Tucumcari in the 1930s, it was a city of some several thousand in population (five or six perhaps?) and there was only one black person living in this town. He was a middle aged man and earned his living by shining shoes at barber shop for 5¢ a shine. He saved his money and built a home. As time went on, more black people came to Tucumcari. The school superintendent was Mr. L. H. Rhodes. He came to see me for advise one day since I was the city attorney. I asked, ”Who is objecting to this boy going to school?” He didn’t want to say who it was. I insisted, I needed to know all the facts. He named an ind­ividual who was to say the least not a leader in this community, but was appar­ently uneducated and perhaps racially biased. Mr. Rhodes reminded me we had a law in New Mexico which followed the United States Supreme Court law, that black people could be compelled to go to school under the doctrine called, “separate but equal.” The “equal” was quite important in this case, meaning the facilities, etc. had to be equal and separate or apart from the other students. I told Mr. Rhodes under this doctrine, the school would have to put this one boy in a good well kept brick building and have a qualified teacher. Perhaps with a masters degree to teach him. The school will have to also have a library equal to the other one for this one boy. The decision was made. The boy was going to the same school with the rest of the children. I would take the responsibility to have it done. I called the sheriff and Chief of Police to be on the watch for the boy when we made the trip to the school the next morning. All went smoothly and there was no need for the authorities, the other children accepted him. This young man finished high school at Tucumcari High and as I recall, he was elected president of his senior class. Later he entered the service. After some years, I had heard he was a captain in the Army. My grandfather left his position as city attorney at some point in the 1940s. Several years later the “ridiculous and foolish” did happen in Tucumcari and across the state. According to the stories in African American History in New Mexico, kids were bused to other towns, like Clovis, in order to keep the schools segregated. L. H. Rhodes was superintendent of the Tucumcari schools for 18 years. The last 4 years of his life were spent working in the Alamogordo school district. He died in 1959. 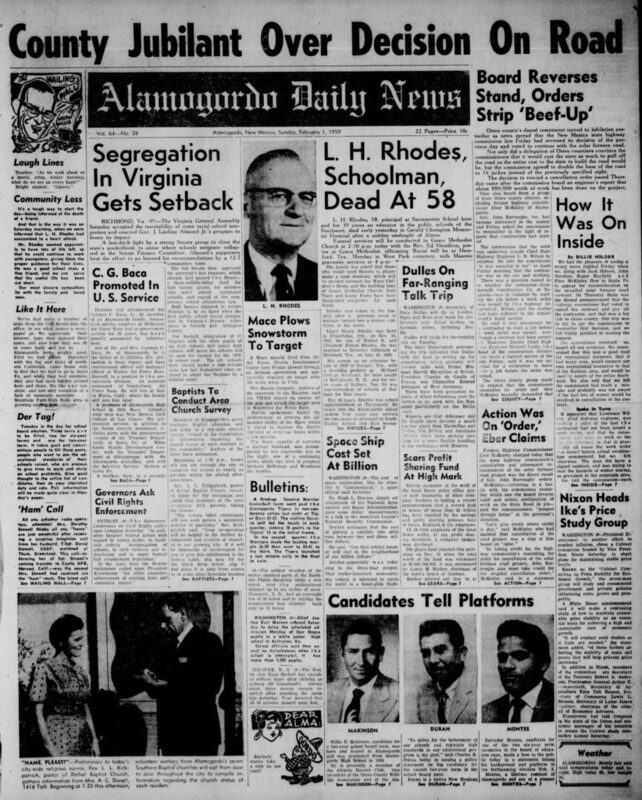 When I found the newspaper clipping about his death, I decided to keep the entire page attached with this story since the article right next to the Rhodes story was actually about segregation in Virginia and another was about a Governor’s Conference on Civil Rights in Detroit that was calling up Congress “to authorize broader federal action with regard to voting rights, to facilitate orderly desegregation of schools, to curb violence and intimidation and to enact federal fair employment legislation.” I thought the entire page was an interesting historical snapshot of what was going on at that time in the country. Laura your stories on here continue to amaze and inspire me! I love your writing style and your heart and honesty in the stories. Thank you for putting them out for us all to read and learn from !! Thanks Michele! This has been a learning experience for me for sure! So many things I wish I could ask my grandparents now that I was sooooo clueless about growing up. I love this post and your site! I have always wondered about how African American families ended up in Tucumcari and NM in general and will look into that book.